September is National Bourbon Heritage Month so we thought it would be appropriate address why Bourbon has always been an American whiskey, but it wasn’t recognized as “America’s Native Spirit” until 1964. In 2007, the Congress decided to make September National Bourbon Heritage Month by unanimous consent. Granted, here at Cleveland Whiskey every month is all about bourbon, but at least there is an entire month for everyone to celebrate America’s Native Spirit. But what makes bourbon so special, especially when spirits like rum and apple brandy were distilled in the Colonies before Bourbon. And while George Washington loved distilling whiskey, it wasn’t his favorite. His stills were originally designed to make rum. Because rum is made with sugarcane and molasses, and who makes those? The answer is the Virgin Islands, which were, and still are, territories of the United Kingdom. George Washington wasn’t just the first president of the United States, he was also the first President to try his hand at farm subsidies. In 1791, the First Congress needed to raise some money. Since America has always been a land of booze-a-plenty, they looked towards distilled spirits. At the time, whiskey was already the preferred spirit in America, but for little reason other than it was the easiest spirit to get. With the exception of ports, most of the country was landlocked. Sugarcane and molasses came in by sea, grain grew on the fertile soil ships couldn’t reach. Therefore, whiskey was a lot easier and cheaper to make than rum. When President Washington imposed these federal taxes on spirits, he also kicked off The Whiskey Rebellion. In short: people freaked out because this tax seemed familiar to the sugar and grain and tea tariffs that ignited the concept of “taxation without representation” in a country where the Revolutionary War was still smoldering in recent memory. This Whiskey Rebellion led President Jefferson to repeal the whiskey portion of the tax in 1802, but most other spirits were still victim, including rum. The War of 1812 exacerbated the issue: not only did America need some cash to fight it, but the British were once again the enemy, and sugar once again supported the economy of an enemy of the state. America decided to come after sugar and molasses imports, and by 1822, rum from the Virgin Isles were hit with 75-110% tariffs. Additionally, American rum distillers were forced to pay nearly 40% taxes on molasses. This effectively made it impossible for traditional distillers along the coast to make a product that could compete with whiskey in the American market. Rum became up to three times more expensive than whiskey, which took rum distillers to their knees. The whiskey business continued to boom, and in port cities where good rum was also relatively affordable, the rum sat and languished for months while whiskey was constantly in short supply. Nearly 35 years later, US Representative Samuel F. Vinton of Ohio argued that spirits taxation should be regional, allowing coastal traders access to bartering their lumber and other industrial goods, for rum and molasses without oppressive tariffs imposed to pay for a war long since over with an enemy we were now cordial with. However, in that period of time since rum and molasses were hammered by brutal taxation, the distillers of Pennsylvania, Kentucky, and Tennessee had become prosperous businesses feeding a demand for high quality spirits, both here and internationally. They were a force to be reckoned with, and rum struggled to catch on, even though more fair economic policy allowed it to be competitively priced. Because of generations of whiskey wisdom, the quality of available whiskey was superior than this newly affordable rum. Rum still languished in warehouses for months, often being purchased only during whiskey shortages. Currently, American rum distillers like Lyon Distilling of Maryland, are producing remarkable and complex rums that challenge even my loyalty to bourbon at the end of a long day or a great night. However, whiskey had a hell of a head start to lock in its dominance, and bourbon has already been America’s Native Spirit for roughly 50 years. Bourbon has to be made in America. Bourbon is a legally protected term with clearly defined standards. This is why we take September, a month one day too short, to celebrate bourbon’s heritage as America’s Native Spirit. Bourbon is definitively American in both its character and steadfast fortitude in the winds of changing times and changing culture, and it keeps getting better and more interesting, especially here at Cleveland Whiskey. 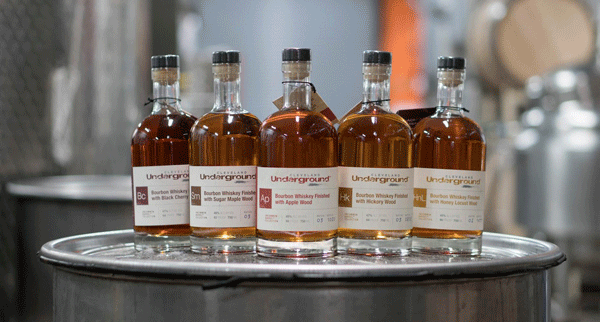 Join us for a distillery tour in September or anytime and come see all the cool things we’re doing in midtown. It’s a lot closer than Kentucky, and while we do things a lot differently than they do, we have more than 60 awards that says we’re doing it well.